We are manufacturer and trader of Stone Crusher Screen which are made up utilizing high grade material and pioneering techniques. Our product has been used in coal crushers, stone crushers etc. 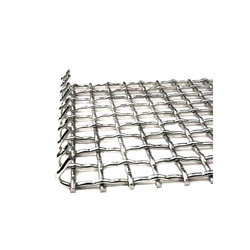 Crusher Screens are prepared with side tensioning as per customer demand. Offered screens are tested on plentiful parameters of quality so as to ensure that the delivered array is free from any end time defect. Size: 1 mm wire dia to 16 mm wire dia.